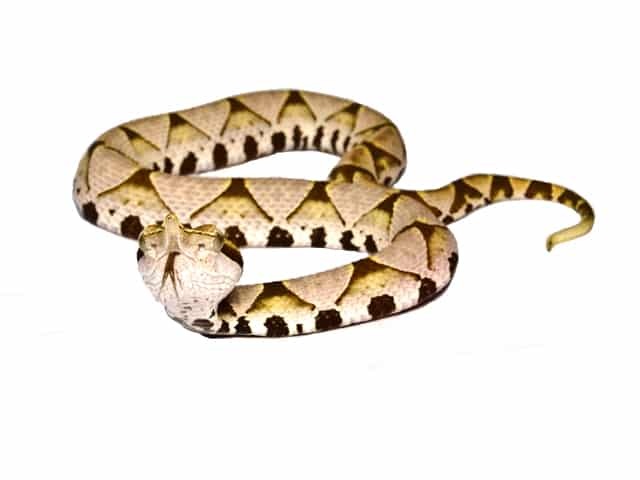 Deinagkistrodon acutus is a medium to large asian pitviper species. Their snout ends in a pointed upward angled scale (horn) which sets it apart from most other species of pitviper from the region. Each side of the body is patterned with a prominent series of 15 to 23 pairs of large dark triangles, with a base color of gray or brown. The venter is whitish and speckled with conspicuous gray and black spots that vary in size and shape. The young are much lighter than the adults with essentially the same pattern. Since these snakes are not the most active snakes and are ambush predators the cage for a single adult snake can be 1 wide x 0.6 deep x 0.5 high meters (3.2 x 2 x 1.6 feet). When kept in pairs more space is recommended because of feeding habits, they can strike with a very savage way during feeding time and cover quite some distance. The additional space is needed so that the snakes won’t strike each other or you during their feeding time. I prefer cages made of wood boards with sliding glass in the front. I don’t use hide boxes with these snakes . Hiding places are made by fixing flat stones together (with tiles glue) to form cavities and some nice pieces of cork bark and a tree stump with some roots still attached make nice hiding places. I prefer a mixture between peat and grinded cocos or bark. At least something that can take a bit of moisture. A layer of 0.05 to 0.10 meters (0.16-0.32 feet) will do the job, topped with some dead leaves for a natural effect when available. These pitvipers do not like high temperatures , nor do they like very bright lighting. When temperatures go over 28 °C (82 °F) they start to suffer from it and even stop feeding. They have their terrarium on the floor of the room and a 25 watt spot light is used in a 1.50 x 0.8 x 0.5 meters (4.9 x 2.6 x 1.6 feet) cage. During summer daytime temperatures are 24-26 °C (75-78 °F) and 21-22 °C (69-71 °F) at nights. Lighting cycle is 13 vs 11 hours (day-night). These values are slowly decreased towards the hibernation period. These snakes need a 2-3 month winter rest period, ranging temperatures between 10-15 °C (50-59 °F) certainly if you want to breed. Make sure to stop feeding 4-6 weeks before putting the snakes in hibernation. I use ceramic drinking dishes of some 0.12-0.15 meters (0.4-0.5 feet) diameter , these can easy be safely removed with 0.4-0.5 meters (1.3-1.6 feet) long hemostats , i clean the water 2x weekly . I have not seen these snakes go in the water if provided with larger bowls, so best to stick with these. All snakes over 1 year in age are very good and enthusiastic feeders on mice, rats or day old chicks either fresh killed or frozen thawed (be sure to warm them up otherwise your hand on the other end of the forceps gives more heat signature and that can go pretty bad ). Be sure to use really long forceps for feeding. Babies can be a challenge to get them eating mouses. Usually about 35-50% of the babies will take live fuzzy/hopper mice (no pinkies, they don’t move enough), some even can eat by tease feeding with frozen thawed good warm prey. But most will only be good feeders when offered small frogs or mice scented with frogs. 80% of the babies will eat frogs with no problem. The terrarium gets a light spray with water 1 x per week usually just before the lights go out. Additionally the hide place close to the water dish is kept mild humid. Since these snakes are found mostly on scrubby mountain and hill sides humidity is not the most important. These are a no joke type of snake, best keep handling to a minimum level. They strike far, very fast and can do so out of the blue. They have long fangs and very toxic venom. Use long hooks and sufficient deep barrels or boxes. In a relax state they get handled easy on hooks, however if they stress out they can be quite a challenge. NEVER TAIL HANDLE THEM. Spot cleaning will most of the time be good. A complete change of substrate and cleaning of the enclosure is given every 2-3 months. If you mist them a couple times during the shedding cycle (from when the eyes start to clear again after the blue face) I never faced any real issues with shedding in this species. Chinese moccasin is a very hardy species , easy to keep and the only problem can be to high temperatures in some countries (like summer in Spain for example)> The babies can be hard to get feeding on rodents.